45 Therefore many of the Jews who had come to visit Mary, and had seen what Jesus did, put their faith in him. 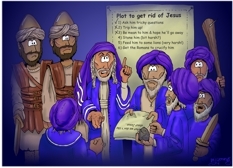 46 But some of them went to the Pharisees and told them what Jesus had done. 47 Then the chief priests and the Pharisees called a meeting of the Sanhedrin. Unknown – but perhaps night time, as the most evil plots are hatched then! In creating a design for the temple guards costumes I was inspired by the costume design from “The Passion” DVD! 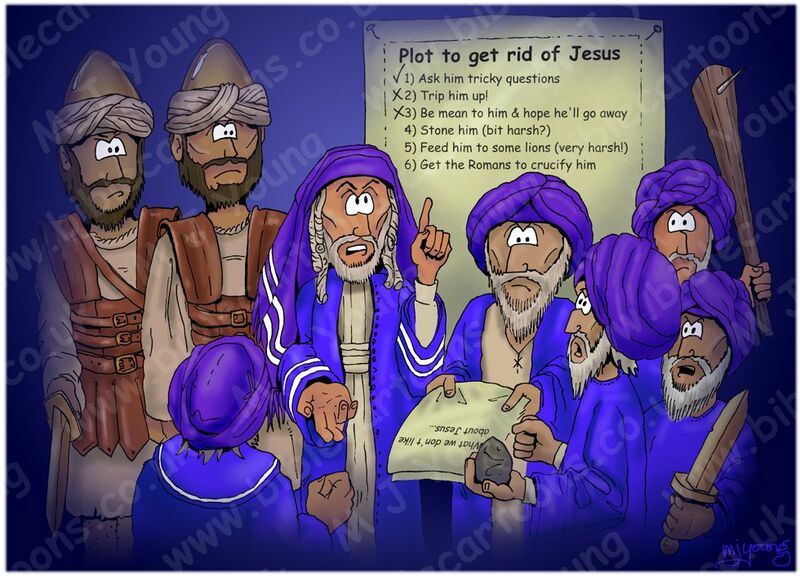 In previous cartoons I had established the Pharisees as wearing dark blue/purple clothes. They are meant to look like a murderous lot of baddies in this cartoon! It was after completng this cartoon that I thought I might need to write a “I’m not trying to offend” statement into my web site!!! I had fun writing up the “plot to get rid of Jesus” notes on the wall!